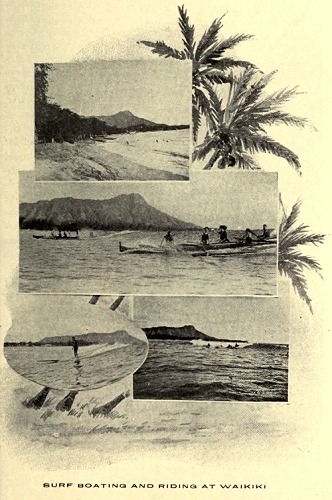 Rice and Perkins : Surf Boating and Riding at Waikiki, 1904. 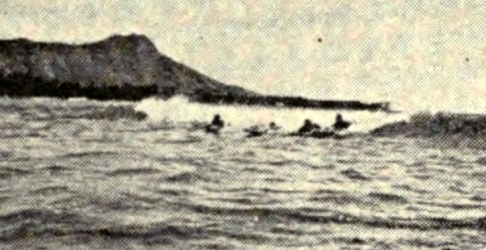 Rice and Perkins: Surf Boating and Riding at Waikiki. Page design by Julian Greenwood. Hawaii, Its People and Their Legends. A booklet for promotional activities, Hawaii, Its People and Their Legends was widely distributed with local hotels providing complimentary copies to their patrons. Both surfboard riding photographs were also reproduced as individual hand-coloured postcards. The two sufboard images with an alternate outrigger canoe photograph were reproduced on an (hand-coloured?) "undivided back" postcard (circa 1901-1907) with the caption "Surf Riding at Waikiki,Honolulu." The photograph of the two outrigger canoes was reproduced in the Outrigger canoe Club program for the Clake Cup Contests in 1910. - DeLaVega: Surfing in Hawai'i (2011), page 49. R. W. Rice and A. W. Perkins opened their photographic studio at 144 Beretaala Street in Honolulu in April 1901. - The Honolulu Republican, Honolulu, April 20, 1901, page 2. The Rice-Perkins partnership was formally disolved in August 1905, the business continuing under Mr. Roscoe Perkins. - The Hawaiian Gazette, Honolulu, August 29, 1905, page 4. Geoff Cater (2012-2016) : Rice and Perkins : Surf Boating and Riding at Waikiki, 1904.